After the brief “correction” in October, the market basically pulled a Men In Black where it essentially looked at the pen and proceeded to forget the past and resumed its ascendency to record highs. I made a couple of moves on my portfolios to bank some profits and to open some new positions. This is despite my feelings that the stock market is still overpriced. Even though I was lying low during summer, I was still checking in and staying engaged with trying to find solid investment opportunities. Here are the decisions I made over the July and August months. For the new additions I put them into Mind Map videos to give you sense of how I scratched out making my decisions. When I was a kid I spent a heck of a lot of time playing video games. I’m totally dating myself here but I had at one point an Intelivision which as the time had the coolest sports games and also a Sega Genesis where I got my first look at Madden Football. Over time I ended up getting Playstation and a Wii but I hardly used them like I did back in the day. Beyond this, I really didn’t know much about video games, but wow have things changed. I had no idea how much of a following games have. The big reason is the ability to play the games online has allowed all sorts of competition. You can literally play anyone anywhere on the planet. To my surprise there are all kinds of tournaments and leagues that have sprouted up and the big one’s offer serious prize money. The other part that floored me was how many people actually will watch other people play video games. The Overwatch League finals were played at the Barclays Center in New York and the arena was sold out! The more I read about it, the more I looked into it. I evaluated a few of the big name game companies which you can find in my Mind Map video pages. 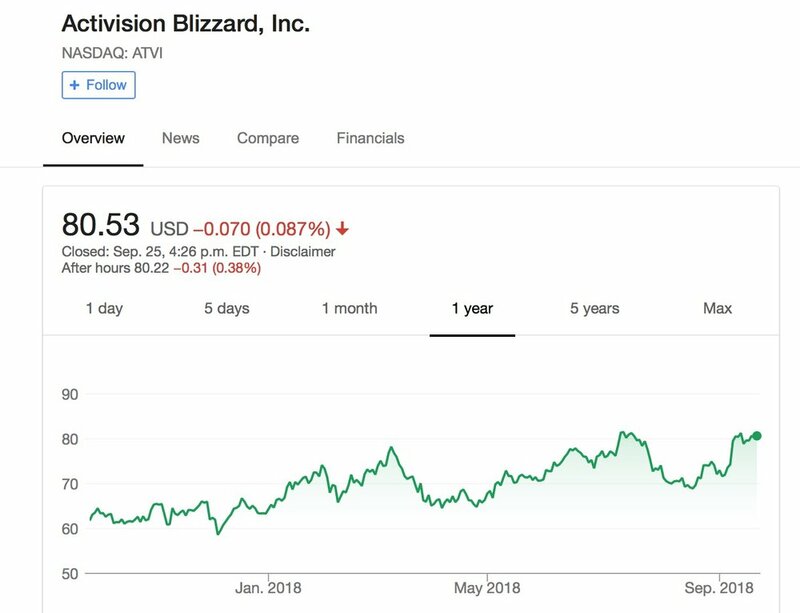 I ended making a move and picking up some shares in Activision Blizzard. Here is my mind map analysis (podcast) that lead me to my decision. UPDATE November 2018: As November wore on the stock kept tracking down and soon my loss position was at 25% which meant the stock would have to go up over 30 percent just to break-even. Given the negative sentiment I didn’t see that happening. I had the stock on a tight leash and so with the latest pullback I said that’s enough. As hard as it is to sell, I have to stay true to my investing playbook and when any stock crosses my loss threshold I have to sell regardless of how I feel about it. It feels painful right now but it is short term pain for long-term preservation of my savings. I still like the company and the whole video game/e-sports space, so I’m still going to keep Activision on my watch list and if the stock continues to track lower then I might jump back in if the fundamentals of the business remain intact. NOTE: In the summer I continued to accumulate shares in JD.com. I was fine to continue on but in September some events occurred that made me re-evaluate my position. I have included those thoughts in the Update after my original thoughts I had during July and August. More trade trash talking by the Mad King. This time the Eye of Sauron is talking about putting tariffs on everything coming out of China, which ironically would include the inputs that are sent to China. I’ve taken up enough hard drive space on the impact of trade wars on stock prices. In the long run it doesn’t help. So JD.com took another hit because of this and I decided to go in and buy more shares to lower my cost base. The Canadian dollar also rose and I got a little more stock for the buck. CEO Richard Liu weighed in with his take and he’s convinced that the company will ride through it. He expects to source more goods from other regions like Europe to offer customers options in relation to the likely more expensive US goods. I figure also they will scale back their push to enter the US mainly because the Mad King’s minions will give them a hard time. With the additional purchases, my cost base on JD is now down to $39. I’m expecting a roller coaster ride with this stock, so I have a firm exit strategy to get out if I’m down 20 percent on it. It’s interesting, JD is pulling about $17-20 billion in revenues per quarter, yet essentially the same business as Amazon with a similar profile and yet JD’s stock has been falling. It’s net income slightly negative because it is doing a lot of capex spending…just like Amazon and yet JD is being discounted by investors. If JD wanted to calibrate and crank out more profit, they could do…just like Amazon (an it appears they are starting to do so). They’re practically the same company! JD because it sells mainly in Asia actually has more pricing power. It could raise prices because it’s normal to do so as inflation is running hot in Asia. This is more difficult for Amazon. It’s a really interesting study. Based on this, I’ve decided I would rather buy the cheaper derivative of the online retailer. I decided to buy some more shares as news came out that MGM had signed a deal with the NBAto license their data as part of building out their sports gambling platform. They are so far the first casino to sign this kind of partnership with a professional sports league since the Supreme Court ruling that essentially legalized sports gambling in the US. MGM also signed a deal with a UK sports book to partner up on a sports gambling platform in the US. 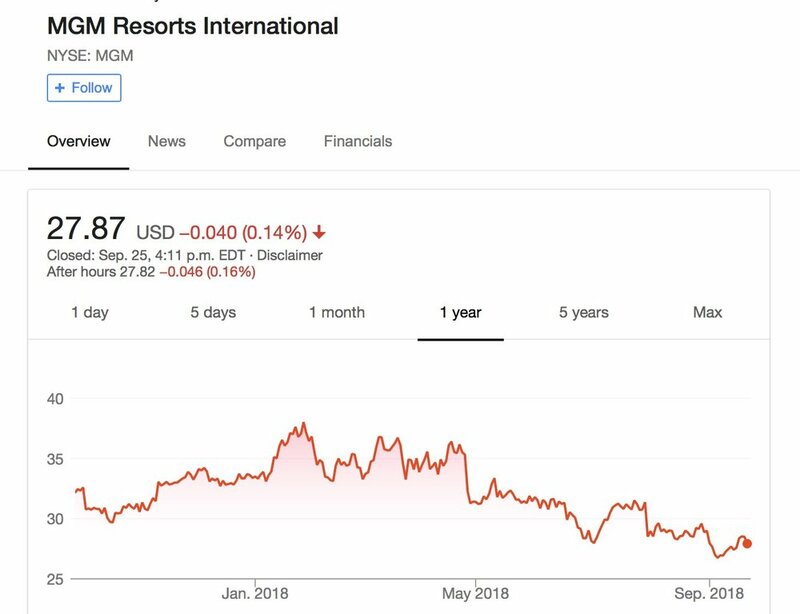 In my decision to buy MGM, I cited a big reason was they have been working a lot at developing an online and physical sports book presence as they were anticipating a positive ruling. Right now it looks like they are quite far along and ahead of the curve compared to the other casinos but I’m sure they will catch up. In addition recent numbers from Macau showed that revenues are pretty solid. Despite all this, the stock pulled back 4 percent, so I decided to use the drop to buy some more shares to lower my cost base to $31.50/share. Sold shares in iShares Pharmaceutical ETF (Ticker: XPH) for 18.4% gain (net FX). 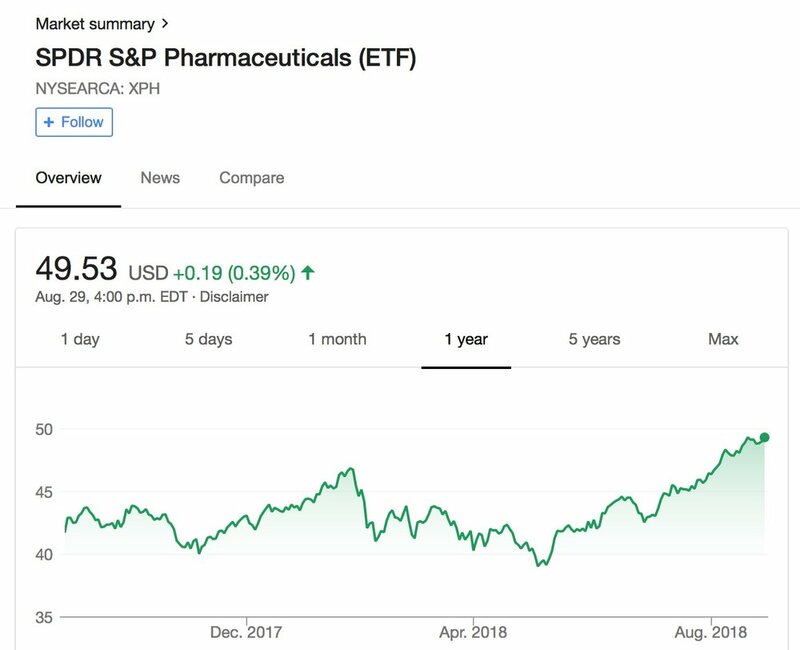 When I bought this ETF earlier in the year, the Pharma sector was one of the worst performing sectors in the market. While everyone was buying FANG, I was buying drugs. The one area I haven’t had a good run is healthcare stocks, so I decided that I was going to hold a basket of drug companies instead of figuring out which ones to get because the unpredictable regulatory of nature of drug care just isn’t worth trying to figure out. It doesn’t help to have the President of the United States trashing the sector and threatening them to lower their prices. I bought the iShares product as it was lowest cost and had broad exposure to a variety of drug stocks. I thought given how out of favour the sector has been that I would be holding this one for a while and I could take my time building up a healthy position. Sure enough this sector has been methodically making its way back and I’ve been fortunate to be along for the ride. I probably could have held on further, but I think because I’ve had so-so experiences with health care stocks, that for my confidence, that I thought I should bank the profit and lock in a small win. It wouldn’t surprise me to see the sector keep moving. I’m happy to bank a healthy profit and will keep the ETF on my watch list in case there’s a pullback.